I went surfing with Surfer Aaron about a month ago, and at the time, I was totally impressed by the beauty of that part of the island. 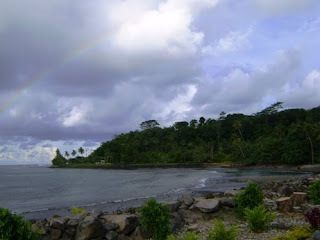 Even more exciting was its proximity to Apia, and therefore to my house. In addition to its closeness, it is, of course, right on the ocean, so the path there is relatively flat and perfect for a bike ride. So I’d been itching to bike out there ever since, and finally Jordan, Blakey, and I did it yesterday afternoon. We met up at the Peace Corps office at 4 p.m., and we headed out despite ominous clouds in the distance. The path was pretty flat. 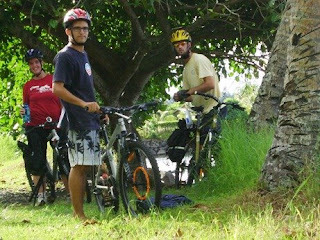 There were rolling hills to be expected, but nothing to steep—with the exception of one particularly abrupt downhill on the way out, which turned into one particularly steep uphill on the return, but all of us were able to handle it pretty well. 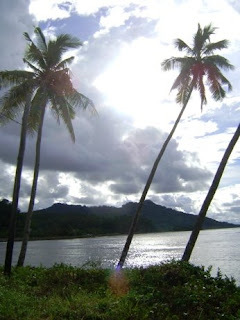 I think all of us were a bit surprised by the relative ease with which we could get to a part of the island that felt wholly different from Apia. After about a half hour of biking, things became quite green and rural. It also become obvious early on that we had chosen an awkward time for the trip. Just as we were coming through rural villages on our bikes, people were heading down the street for afternoon church services in their Sunday best. This juxtaposition is awkward in American culture, but it can be downright rude in Samoan culture, and we were a bit uneasy about the whole thing. The Samoans we saw along the way were pretty friendly though. Most smiled and offered a friendly, “Mālō.” We made a few stops along the way for water or to take photographs and occasionally we fell into longer conversations. Time started to become an issue. The sun sets around 7:00 p.m., and by 5:30, we had made it to the destination village, Luatuanu’u, but not to the actual surfing spot. But the point of the trip had little to do with arriving at the specific destination, and none of us had a problem with forgoing the surfing spot in order to arrive home before dark. And that was good because halfway home, it began to rain. I’ve noted this before, but you can literally hear the rain coming here. So when Jordan turned to me and said, “That’s rain a quarter-mile up,” I pulled over to the side of the road and stowed my camera in a plastic bag. 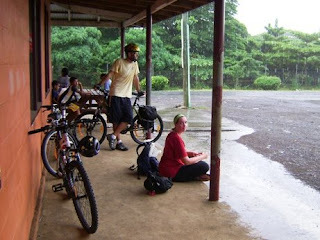 We stopped at a faleoloa for some temporary shelter, and when it died down to a steady sprinkle, we got back on the road. It was a good, easy way to spend a Sunday afternoon, and I’d definitely do it again. Hell, I’d do it nearly any day of the week, it was so easy and accessible. I was at the Peace Corps office when Sara called and invited me to dinner. “Cale figured out how to make Gyros.” I was down. It’s not good to ride a bike long distances after dark, so I’d probably need to get a taxi and pick up my bike from their house later. I headed to the bank and then to the grocery store to pick up a bottle of wine, and on my way out, a bus for their village was pulling up to the stop. So I made a game-time decision and left my bike locked to the planter box in front of the grocery store. This seemed like a precarious arrangement, but it was easier logistically, and the timely arrival of the bus made it seem like fate was doing me a favor. Cale’s gyros-from-scratch were fantastic. As was the conversation. I bought white wine by accident (damn you, poorly lit liquor section), but it was no big deal. And then while I was standing on the road waiting for a taxi, one of Ryan 79’s tae kwon do students happened to be driving by and offered me a ride back to Apia. Bonus! So yeah. I get around. Hope you do too. Pictures below. 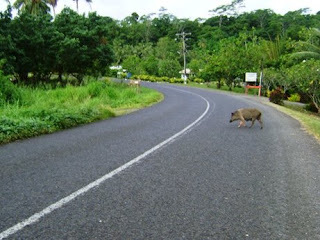 This pig was leisurely crossing the street. I had time to pull my camera out without coming to a full stop. The view from the spot where we stopped to turn around. If you look closely, you can kind of make out a rainbow in the upper left. It was cooler in person. You kinda had to be there. Waiting for the rain to pass. 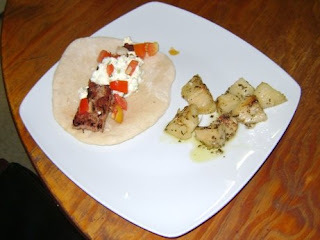 Cale's gyro and Greek potatoes. So gorgeous! I wanna go on a bike ride! PS I like your shorts!! Careful about surfing on Sundays! A PCV *died* ca. 1971 because he went swimming on the sabbath, and so (according to the song) God sent a shark to eat him. Didn't they warn you about that? I thought you were going to say someone stole your bike!! !